DNA is an extremely important molecule in Biology, it carries the genetic code; instructs protein synthesis; can replicate itself; and is thought to be the basis of all life on earth! A deoxyribose sugar, a 5 carbon monosacharide. A base which can either be adenine, thymine, guanine or cytosine (more on these below). 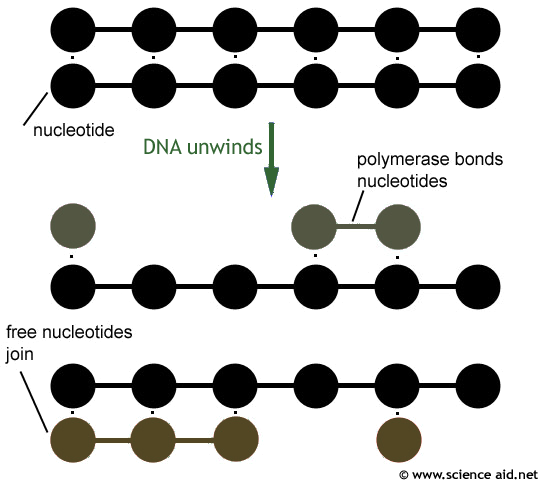 The nucleotide is represented as in the diagram below, where each component is shown by a different shape. 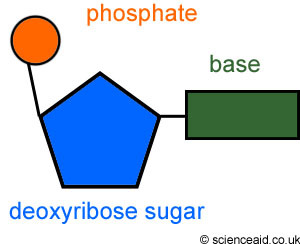 The nucleotides form the polymer DNA or deoxyribonucleic acid [dee-ox-ee-ry-bo-new-clay-ik]. It's structure is the double helix. It is best described as a twisted ladder, where the sides are the phosphate-sugar chain, whilst the rungs are the bases. One of the special characteristics of DNA is that it can replicate, this is useful when making new cells in the cell cycle. The process is said to be semi-coservative since it conserves (or keeps) one of the original strands in the new DNA molecule. The first stage is for the two strands in DNA to unwind and the hydrogen bonds holding them together are broken. Next, free nucleotides that are floating around match up with the bases and complimentary base pairing takes place. 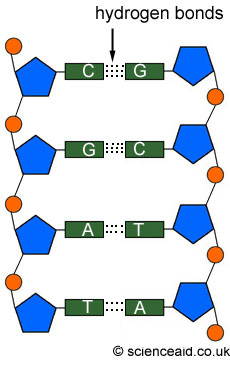 As these nucleotides are matching up, an enzyme called DNA polymerase makes them bond to each other, therefore connecting up the new strand. Finally, the new strand is complete and it twists into the double helix shape! This process is artificial DNA replication, used to make copies of DNA that may be needed for genetic testing and other times when you lots of bits of one part of DNA. It is very simple, the following ingredients are added to a test tube: the original DNA sample, nucleotides, DNA polymerase and primers (bind to DNA and instructs replication to begin). The DNA is heated to 95°C for a few minutes, this causes the DNA strands to seperate. It is now cooled with primers so they can bind to the DNA. Finally the solution is raised to about 70°C and the polymerase enzyme acts to add the complimentary bases. This process is repeated many more times so that hundreds and thousands of copies are made of this piece of DNA: and there we have it, very simple really. The enzymes used in this process are from bacteria that live in very warm conditions (by sea vents for example), this is because they have enzymes that are adapted to the high temperatures. So when the sample is heated to seperate DNA, the enzymes will not denature.